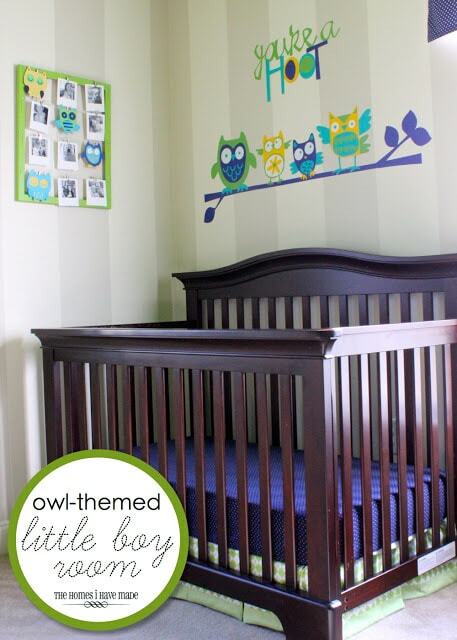 As I was going through a lot of my project photos in preparation for the Owl Nursery Reveal post, I realized that I made quite a bit of STUFF in preparation for little He-Man’s arrival! 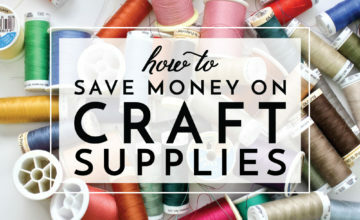 While I loved every single minute of my first-baby sewing and crafting (and wouldn’t trade those hours of nesting and preparations for anything)…I realize NOW that there were some things that I spent precious hours and precious fabric on, and never really used them! 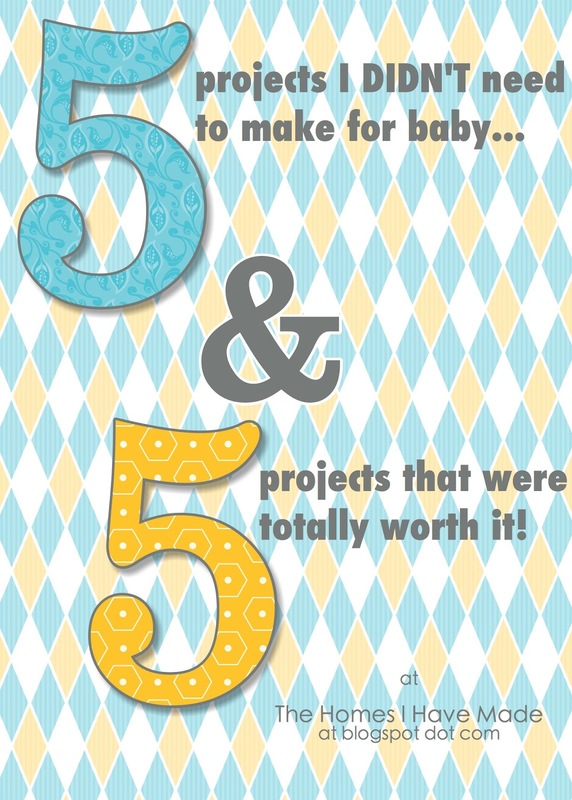 So today, I thought I would round up my 5 best things to make for baby, and 5 that aren’t worth the time or effort! I am by no means a “seasoned Mom.” After all, my He-Man is only 10 months old and I still have lots of learning to do. But for whatever it’s worth, to whomever is out there…here are 5 projects that weren’t worth my time or fabric, and 5 that totally were! 5 projects that were NOT a good use of my time or material! 1. The Nursing Cover! This was one of the very first items I made, convinced that it was on my “absolute necessity” list. I even purchased a pattern for this one (shame on me, there are so many free tutorials out there!). Turns out I used this only a handful of times. My baby hated to have his head covered while feeding, and I soon found out that a cardigan sweater with a swaddling blanket draped across worked just as well, if not better! Although fun, this bright-patterned cover also screamed out “look at me, I’m feeding my baby!” LOL! 3. The Crib Bumper! 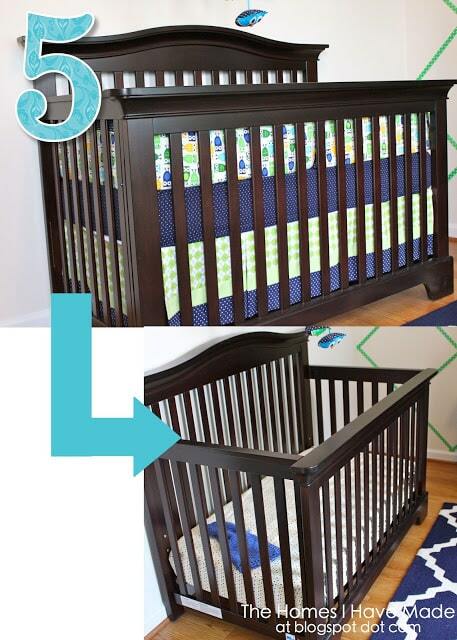 Ahh…the crib bumper. I must have read at least one thousand times that crib bumpers were not recommended for safety and SIDS prevention. Still, for some reason, I was hell-bent on making one…and not just any one…a pretty detailed one with two fabrics and piping detail. This was a long project (because there were 6 of them) and took up a ton of fabric, and we only put it in the crib a few times…AND when the baby wasn’t in it! I thought I would put the bumper in for naps or during the day (almost like “making the bed”). Ha…that never happens. The bumper is now stored under the crib, folded up, and not used at all….So sad, because it is so cute. I should have headed all those warnings from experienced Momma’s that I didn’t need one! 4. Toy Blocks! 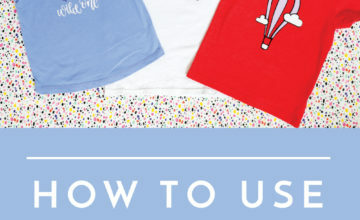 When it comes to some things, I can have a “More is Better” versus “Less is Better” mentality..ESPECIALLY when it comes to cute fabrics and baby things! I made 3 very cute 8″ stuffed blocks and just loved the way they turned out. Then I found this picture, and went to town making more and more stuffed blocks in all sorts of shapes and sizes. I learned two things with this project. First, more is NOT better…the novelty of these blocks didn’t last long with baby. 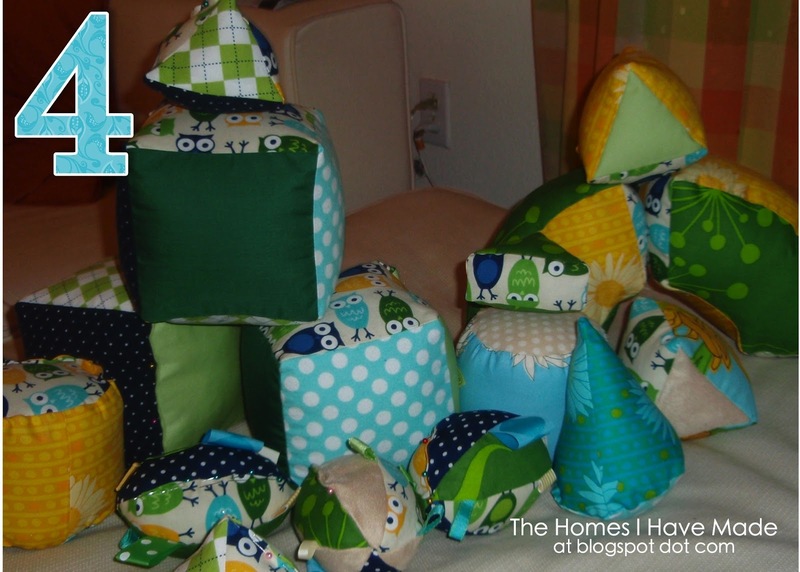 And second, you need foam blocks (not cotton stuffing) to make these blocks stackable and hold their shape. I kept the original 3 blocks…the rest are out in the garage sale pile. Boo. 5. 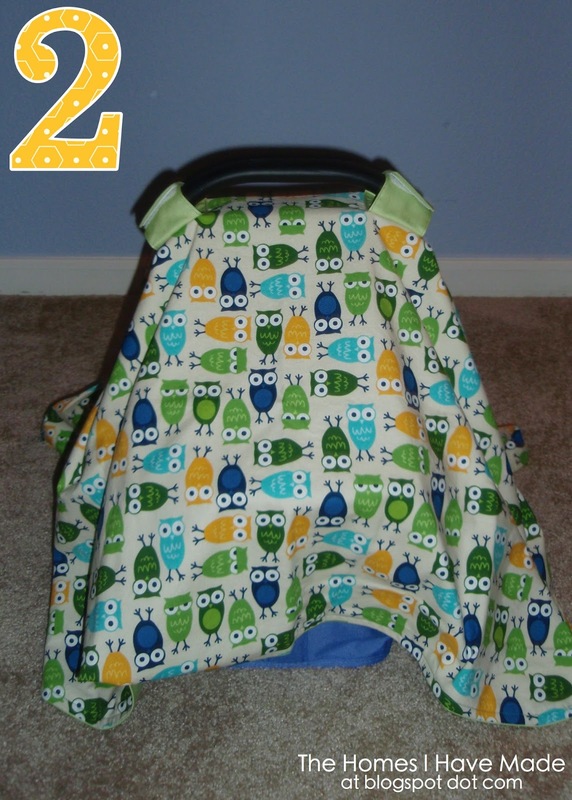 The Crib Skirt! This is another project that took a TON of time and a TON of fabric for very little pay off. I mentioned before that I made this skirt before we bought our crib. When we picked out a crib with rails almost to the floor, the adorable crib skirt got very lost. Then, recently, we dropped down the crib to its lowest setting, and the crib skirt is too long, so we took it off completely. Now, I do have every intention of hemming it because I like the dose of color…but still…this is a project that I wouldn’t have spent nearly the time agonizing over. 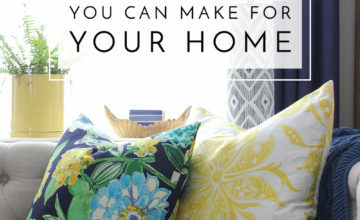 5 projects that were completely worth it! 1. The Foldable Changing Pad! I bought this pattern too, and it was totally worth it. Although I could have figured it out myself, this was a quick and easy project and all I had to do was follow the directions. I love that the diapers and wipes are connected to the changing pad, so they don’t get lost in the Diaper Bag Abyss. We take this everywhere we go – I LUV this thing! The only change I would make is that we never use the vinyl side, so it wasn’t worth the headache of sewing with it! 2. Car Seat Cover! I bought this pattern too (I know, I know…this was before I discovered the world of free online tutorials! ), and I think was the very first project I made. Although a blanket does the exact same thing, I found the velcro tabs indispensable in wind and rain! When the baby was very young, I took all my walks with him in his seat covered with this cover. Air was able to flow in through the sides, and I could make quick peeks without disrupting the whole thing! I still keep it in the bottom of the diaper bag for rainy days! 3. 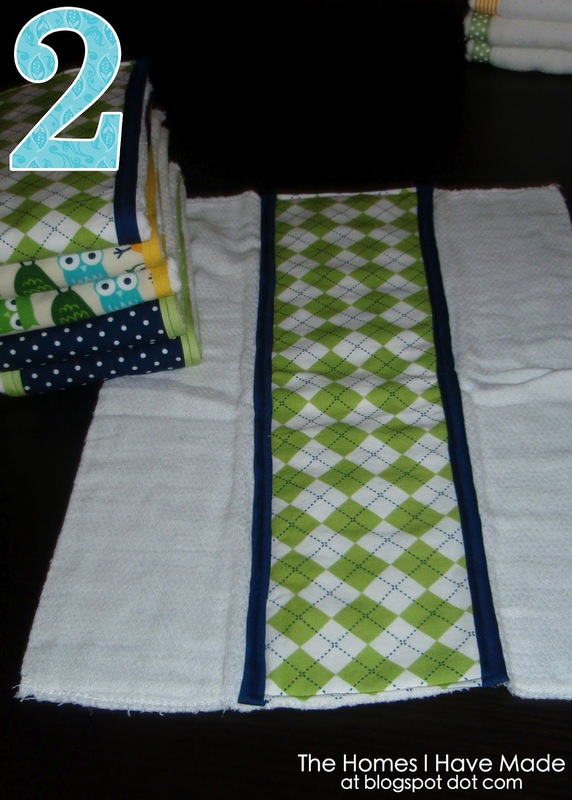 Lots of Burp Cloths! Okay, so ignore the burp cloths on the left because I just told you how much I didn’t like them! Nonetheless, I was so thankful to have 18 burp cloths in my stash. I thought I went a little overboard at first, but once the baby was born and we were doing laundry strictly to wash burp cloths, I was glad we had so many. The middle ones, with the ribbon detail, were my favorite! Cute and absorbable. 4. 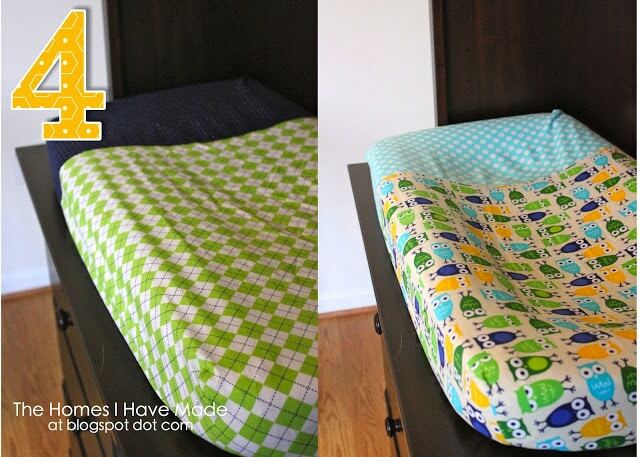 Changing Pad Covers X2! I mentioned this in my last post, but I was SO glad I made two of these changing pad covers. Not only did I like the designated place to put baby’s head (not that big of a deal to many people probably, but my husband is a lefty and would change the baby the other way if he didn’t have a visual reminder!!). Making two was key: when one went in the laundry…I had another one at the ready! 5. Hooded Towel! 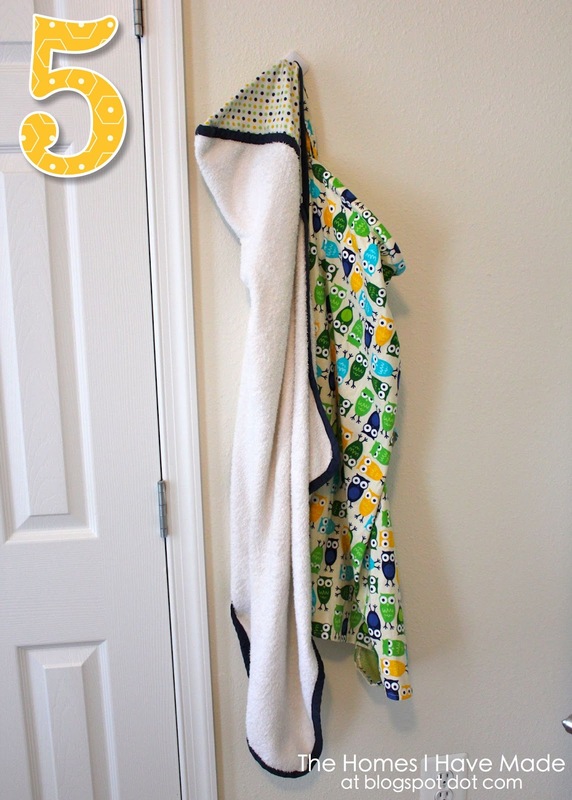 I didn’t include this in my original post, but I made this hooded towel using directions from my favorite web site, Sew4Home. It was super easy to make! Using matching fabric to the baby’s room, it turned out adorable. We use this towel EVERY NIGHT…I wish I had made two of this also! It’s not size specific, so it worked with a newborn, and it will probably work until he’s 45 years old (well…depending on how big his head gets…and if he still wants to use his baby towel as a middle-aged man!). I loved that it wasn’t an animal or gimmick-y. 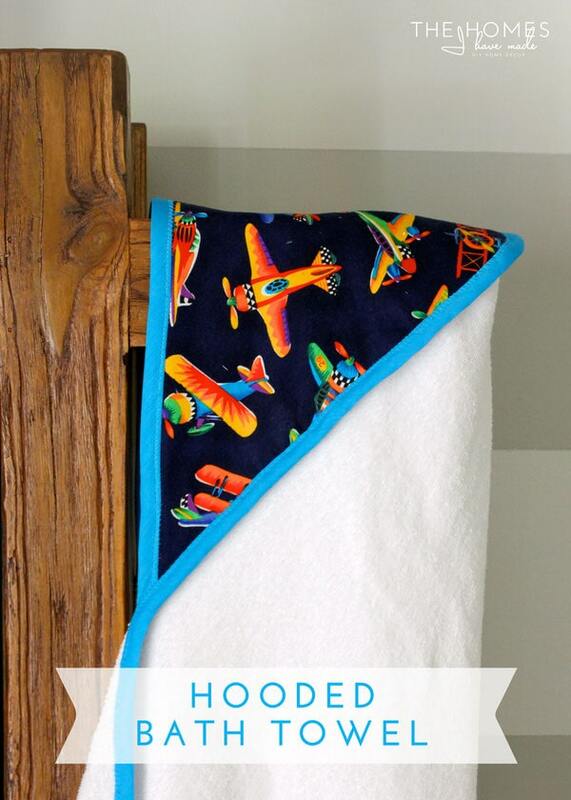 Just a simple hooded towel for baby! So there you have it! 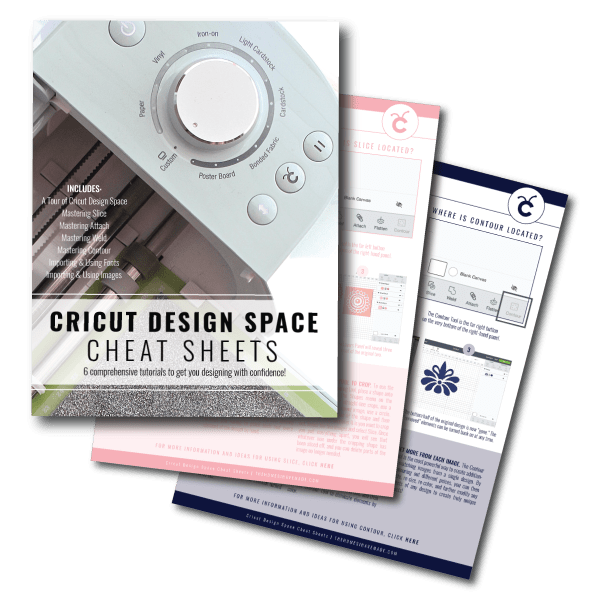 5 projects I wouldn’t make again, and 5 projects I would. 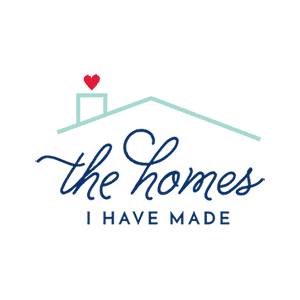 I had some other things that would make the “would make again” list (like the mobile, the laundry bag, and the crib sheets), but these are my top 5! Anyone else in the same boat? Are there things you found you needed or didn’t need once the baby arrived? A Few (Random) Things I've Been Up To! I did the same thing with bumper pads and completely agree with you on needing LOTS of burp cloths (that actually absorb)! What a great idea for a post! It is funny how you never know until the baby comes what you will or won't use. 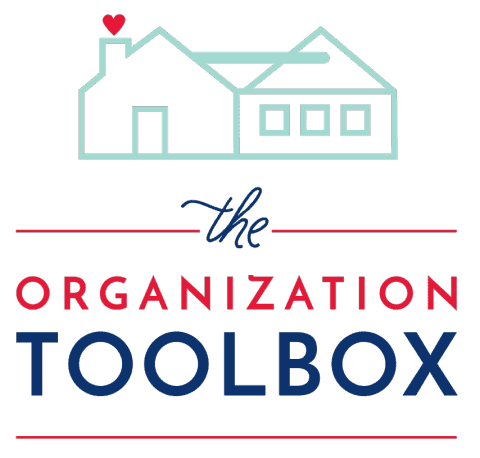 Thanks so much for linking up this week! I totally agree with your list. I never used the nursing cover. My kids just didn't like it. And if I had to recommend something to someone else, I would recommend just a simple little strap with suspender clips on either end. That way you could turn any blanket you have with you into an impromptu cover when necessary. I love my nursing cover. I have 2 and i use them everyday 🙂 i guess it depends on your babyand your lifestyle. I'm sure you're not using burp rags much any more, but for the next one, try flannel. 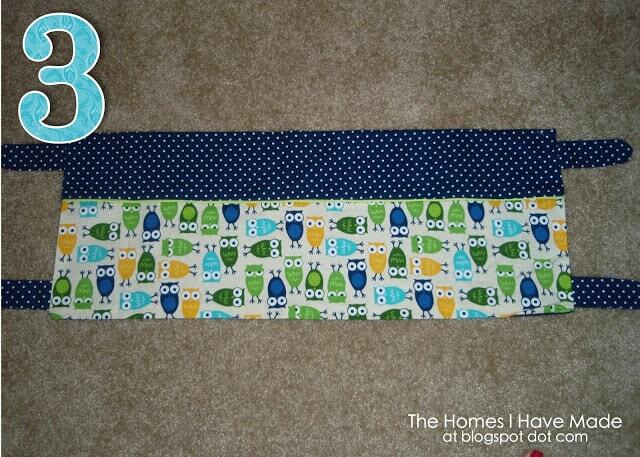 Cute patterns and I liked them way better than the tri-fold ones for softness and absorbancy. As far as burp clothes go, if you use flannel as the cute fabric to embellish with, they are super absorbent and by far my favorite. 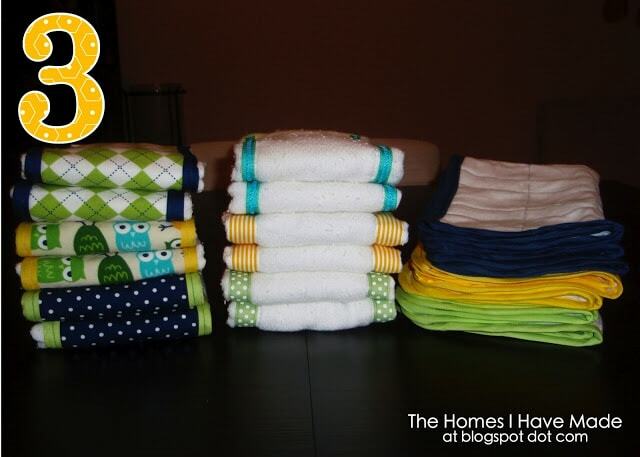 I have some just flannel and the work good to, but the diapers with flannel in the middle are fabulous! I like to make handmade gifts for my friends' babies, but I worry that what I made them is useless! I've thought about making the burp cloths and I'm glad I didn't! 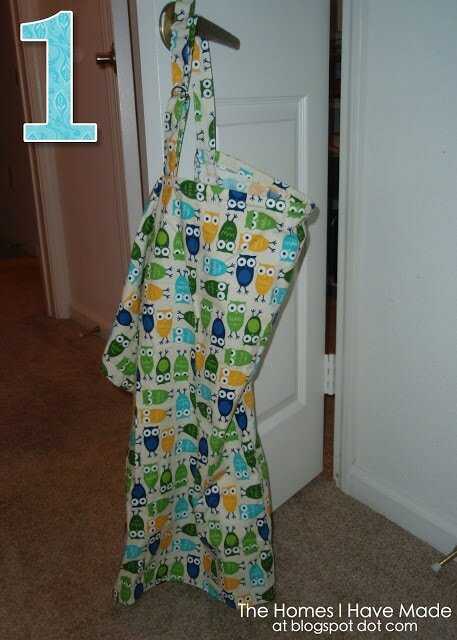 Hey everybody, I just wanted to comment that my sister just had her 2nd son and because she is a working mom who is breastfeeding she uses her nursing cover to pump while she is on the go and it is super handy for her! Hey, I just wanted to comment that my sister just had her 2nd son and because she is a working mom that is also breastfeeding; she uses her nursing cover to pump when needed. She had my mom make her a larger size to make her more comfortable but other than that loves it! 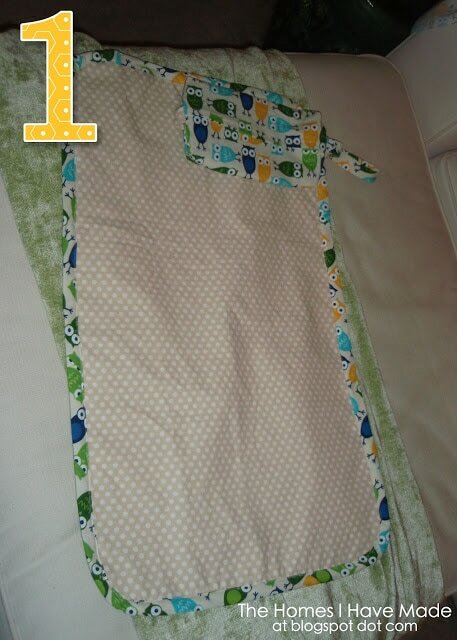 I have also made the cotton burp cloths with the same results. I hated them, not only did they not work but were uncomfortable for baby's skin. I just finished making 3 changing pad covers. This way in case I don't get the laundry done I do have a spare. I bought brown minky fabric when I had a coupon for half off and bought 4 yards on a trip back from my hometown. I am working on some other projects for baby coming in May. I don't want to spend an arm and a leg for things I can get second hand or make myself. 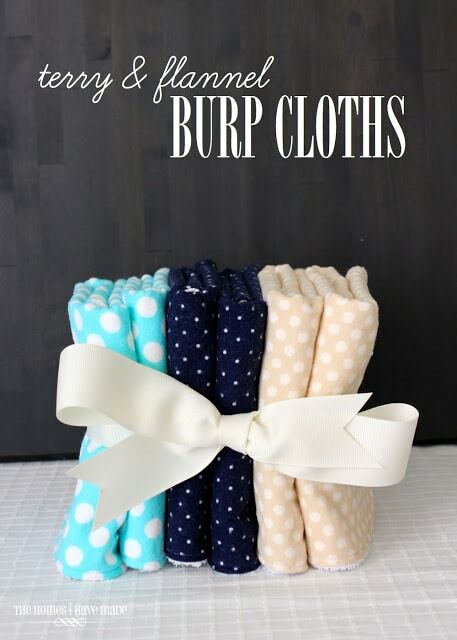 😉 I will be adding burp cloths to my list, but have to wait until I either buy online or drive a couple hours or more to the nearest craft store for the terry cloth. 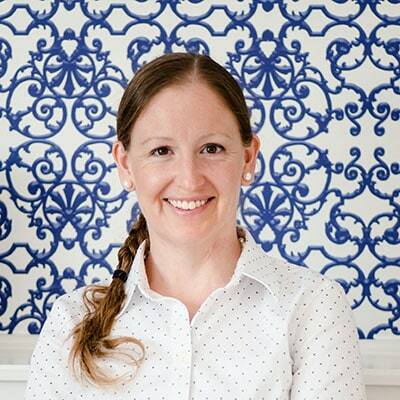 As a mother of five (now grown and on their own), I can assure you that every day and each year with your child(ren) is a learning experience!
" forts" and these would be great for that! Thank you for this list! I'm making things for my first niece and appariapte input as I have no children myself… I am sew glad you said about those trifold cloth diapers for burp cloths… I see them covered with cotton in the middle all over the internet and all I can think is, that can't be soft or absorbant, and the edges are super thin… I have flannel and terry and plan to do what you did…the ribbon ones you mentioned.. Are those the same as your tute on here, just an added embellishment? Can you post how you did the burp cloths that you did like? Or the tutorial you used and your supplies? My friend loves her cloth diapers(not decorated, just white) for burp cloths! I have made a few, but think I can make better ones. Thanks in advance! I love my nursing cover! I have 6 kids from 2 – 19 years old. The nursing covers were invented after my 4 th child. I used them at home and on the go because I had big kids around. It depends on what your child gets used to. If it is your first child and you r mostly home alone and u don’t need one then baby would not get used to it! Thanks for sharing, Debbie! From people I have talked to with more kids, nursing covers seem to be one of those things that take practice…and it helps when your child is okay with it. I have friends who swear by them, my little guy would just never stay under it! 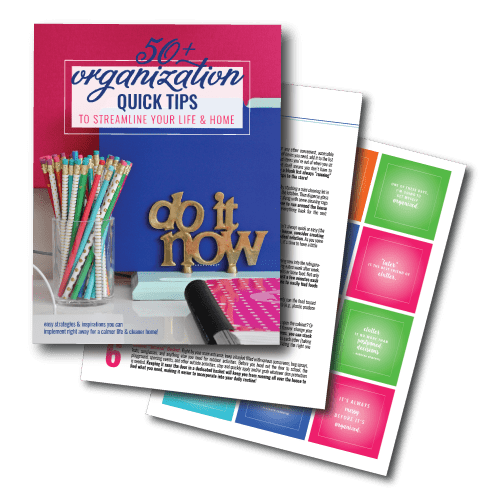 I am really glad I found your article… I thought of some of these for my nursery but I might skip them… Thanks for sharing your feedback!!! You are so right about all 5 of those things you didn’t need, especially the crib stuff. I don’t sew but one of my first purchases when I found out I was pregnant was a crib set (thank goodness it was on sale since man they can be expensive) and I’ve never even opened it! Thank you so much Jodi! Glad you found my lists helpful! I did eventually repurpose my son’s bedding into his window valences, so I guess it wasn’t a total loss, lol! I know it’s kinda late now to mention it as I’m seeing this post several years after it was written….but I’m wondering why it’s bad if your husband changes the baby the other way? I’m a lefty and I would not be capable of changing my baby with his head in that designated location because my dominant hand would not be in the proper position. It would be like asking me to feed the baby with my right hand. I couldn’t get my husband to change diapers so I’m hoping yours was able to with having to do it like a righty.